OMAHA, Neb. (KMTV) — The government shutdown is now in its second month and TSA agents and air traffic controllers will be going without paychecks for the second time on Friday. 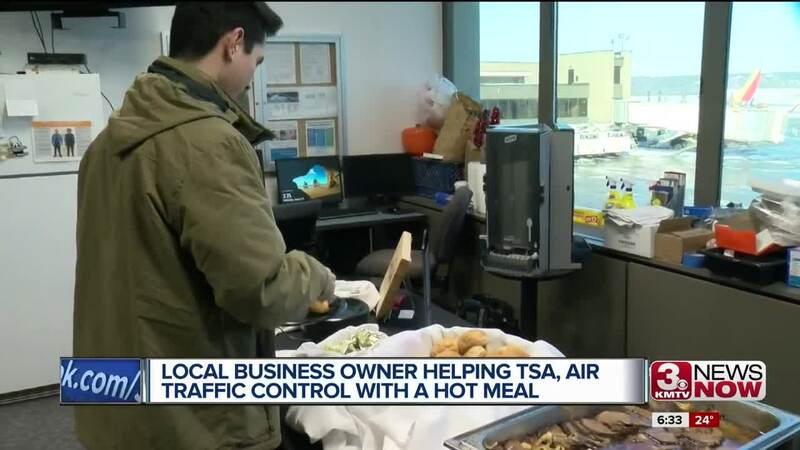 One local business owner who operates out of Eppley Airfield is working to help out during the shutdown, one hot meal at a time. "These guys are the reason why we all fly safe, passengers fly safe, the planes can fly safely, around this airport and across the country," said Pamela Briere, owner of Kracky McGee's and Save the Date catering. Pamela Briere works closely with TSA agents everyday to run her restaurant Kracky McGee’s in Terminal A. "My heart aches for them," said Briere. "My heart melts for them and it’s always good in these situations to give an act of kindness to let them know the community cares." Briere catered warm meals for the crews on the morning and night shifts in a gesture of thanks. "Roast beef, garlic. Some onions. You can smell it, it smells really amazing," said Briere. "We got some green beans and some Yukon gold mashed potatoes. So it was really important for me to provide them with a nice hot meal." "Another agent told me that this was perfect timing because she now has run out of money for lunches," said Briere. More than 130 warm meals were provided in a gesture of kindness during a time of a government divided.